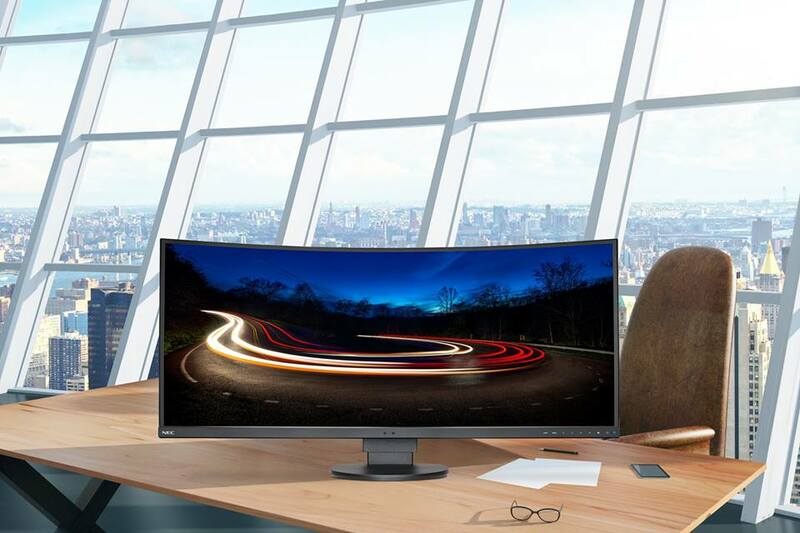 A lot of curved monitors, like Samsung’s CH711 Quantum Dot offering and Acer’s recent XR382CQK, for example, are marketed specifically to gamers but curved panels are also great for business, finance and even command-and-control users as NEC’s latest attempts to demonstrate. The NEC MultiSync EX431R-BK is a 34-incher with a resolution of 3,440 x 1,440 (21:9 aspect ratio) featuring an 1800R curve and a SVA panel. NEC says its new offering includes factory calibration and uniformity correction and is compatible with its SpectraViewII software to ensure colors are uniform and accurate. The monitor is designed to reduce eye strain as it is certified for Low Blue Light Content and Flicker-Free from TÜV Rheinland, an international service group that documents the quality and safety of various products and services. It also comes equipped with NEC’s human presence sensor which can power down the panel when you step away from your computer in order to reduce energy consumption and potentially prolong the monitor’s lifespan. You get a 1.55mm narrow bezel on three sides and dual 1-watt speakers as well as a variety of connectivity ports including two HDMI ports, four USB 3.0 ports and DisplayPort 1.2 input and output. The NEC EX341R-BK goes on sale this month priced at $999. If you want the optional SpectraViewII software (model EX341R-BK-SV), that can be bundled in for a total of $1,149.